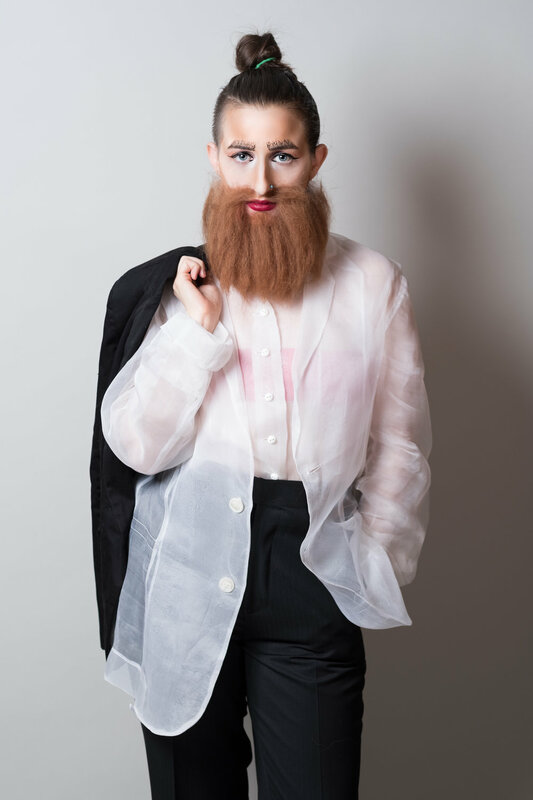 I am your favorite bearded Jewish drag king. I design and build my own beards, always keeping my looks somewhat androgynous. There is nothing like striking facial hair with a strong lip! I often perform classic drag numbers with a Jewish or middle eastern flair. You can find me in bars, clubs, cabaret nights, or in the incredible show Red and Boilling which has performed internationally! Become a #hasafan today and follow me on Instagram and Twitter! Growing up as a queer person in Jerusalem, a religious city, was a difficult time in my life. I experienced personally and witnessed my LGBTQ family face discrimination, violence, and pain on a daily basis. In many ways these memories still reverberate through my body, and the sense of alienation in my home town always cuts me to the bone. That is what led me to be an activist, and over time I have grown to be thankful for it as well. These hard times in my life have formed who I am today. They made me into the artist, actor, creator and community member that I am. It built up my resilience, fearlessness and perseverance. It taught me not to apologize for any part of my identity, and fight the battles I believe in.